EDIT: Giveaway is officially over. Congratulations to Amy Tolley for submitting the randomly chosen 296th entry. The thermometer in my car reached 90 degrees today and that means it's officially beach season! 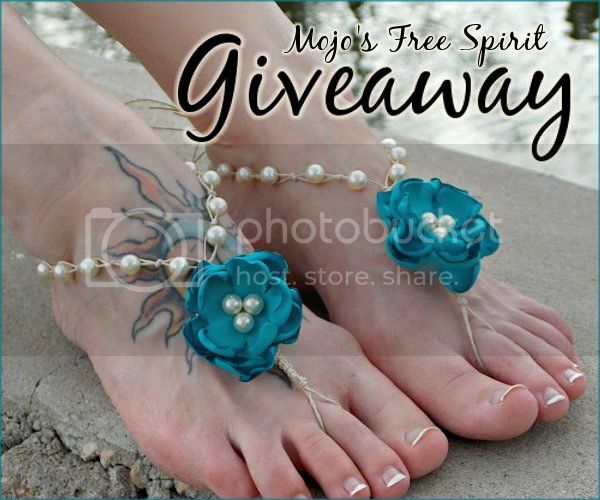 No, you're not suffering from heatstroke - Moriah of Mojo's Free Spirit is really giving away a pair of her beautiful beaded barefoot sandals to one lucky beach bunny. The fabulous foot jewelry is handmade with eco-friendly hemp cord entwined around choice of ivory or white Swarovski pearls. A fabric flower hand crafted from bridal satin completes the elegant design. The winner can choose from over a dozen colors, so she'll have no trouble matching the flower to a bathing suit, belly dance costume or wedding dress. In addition to a variety of other hemp sandal styles for both women and men, Moriah makes other bohemian accessories that will keep any outfit looking cool even on the most sweltering of summer days. Her Etsy shop is a hippie's paradise of feather jewelry, boho headbands and flower hair clips. And she's offering a hot deal exclusively to my blog readers. Use coupon code "AQUARIANN15" during checkout before June 30, 2013 and save 15% off any order! Use the Rafflecopter below to enter to win fashion giveaway before 11:59pm EST on June 20, 2013. Be sure to leave the mandatory comment on the blog post with the same name you use to fill out the Rafflecopter - all entries by winner must be easily verified or a new winner will be chosen. Not including usernames when asked will also get you disqualified. I'm planning a beach destination wedding so the bridal ones would be perfect!! I would pick one, but there are WAY too many to choose from! Want ALL the sandals! I love the elegant feather sandals. So delicate and intricate! I really love the Dream Catcher Feather Necklace it is so beautiful! The Bridal barefoot sandals are SO beautifully crafted. So they have to be my favorite. I like Elegant Feather Sandals. I love bohemian foot sandals! I love the bohemian barefoot sandals. the elegant feather sandals are beautiful! I absolutely love the Colorful Feather hair Clip Long feather Clip Feather Extensions Hair Feathers Braided Hemp Clip summer music festivals Hippie feathers. I can imagine wearing this hair clip and feeling like I have been transported to a tropical rain forest!! I love the bridal barefoot sandals (the red ones) the most. They would be amazing to wear with a belly dance costume. My favorite uten us the dream catcher necklace! I like the Princess barefoot wedding sandals. I love the wedding barefoot sandals! Barefoot Sandals Wedding Shoes Bridal Sandals Beach Garden Wedding Bridesmaids Fuchsia Pantone Spring Colors Flowers Ostrich Feathers. Thankk you for this great giveaway! thanks and have an awesome weekend! My favorite is the Barefoot Sandals African Violet Lavender Beach Wedding Shoes. The bridal ones are so sweet!!!!! These are my fave but I love them all!!! My favorite sandals are the Barefoot Sandals Beaded Sandals Bridal Shoes White or Ivory Beach Wedding Sandals Hemp Sandals Toe Thong Barefoot Jewelry even though there are many many beautiful items that I would also love to own. Thank you for the awesome giveaway! I like the Fancy Jasper Barefoot Sandals Toe Thong Bottomless Shoe Hemp Hippie Sandals Boho Stacking Foot Jewelry Green amber. LOVE the Beaded Barefoot Sandals Minimalist Bridesmaids Shoes Poppy Red Pantone Spring Colors Beach Garden Weddings Barefoot Jewelry Toe Thong! This is such a great idea. I have big feet and if I put these amazing beautiful angle toe bracelets on, my big feet no longer stand out as just there, people will notice them in a good way. I love the Barefoot Sandals Bridal Barefoot Sandals Beach Wedding Shoes Garden Wedding Barefoot Jewelry hemp Toe Thong Ivory White. I am in love with the Barefoot Sandals Beaded Sandals Bridal Shoes! I love the Hemp Barefoot Sandals Soft Pink Blush Weddings Bridesmaids foot jewelry Bottomless shoe toe thong boho. They are simple and super sute! The natural starfish ones are gorgeous, too. My favorite is the Stackable Triple Strand Bohemian Bracelet. The turqious ivory ones are my favorite. I love the Peacock Feather Fascinator Bridal Hair Clip.